When You may purchase this Feed Management Software you can evaluate it for 30 day. If you are not completely satisfied with your purchase within that time period you may return it for a full refund, freight excluded. 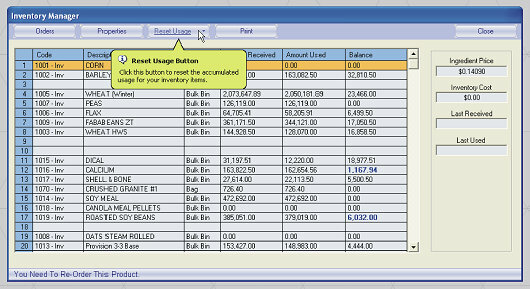 The Inventory Manager module is designed to track the inventory usage and the amount received for every ingredient that has been assigned to an inventory item. Inventory items can be assigned either as a single ingredient reference or as a multi ingredient inventory reference item. As the feed orders are being processed the inventory status is automatically updated and the results are displayed on the screen along with real-time low inventory warnings. New products can be ordered with open purchase orders that are automatically converted to feed orders as the products are being received. Both raw ingredients and ingredients from finished feed can be traced back to the vendors at any time. 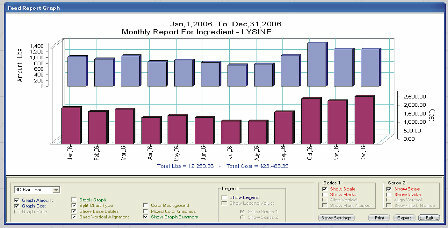 Feed cost and usage reports can be generated by groups, flocks or by Id names, in both text or graphic formats. 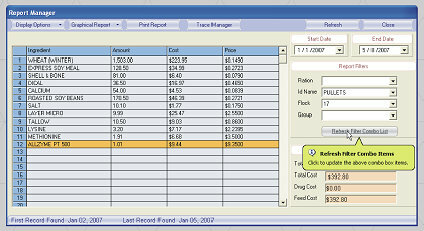 Feed reports can be generated for any given date span. 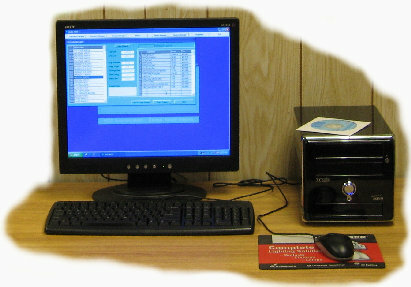 After the reports are displayed on the screen, the user can print preview the printouts results before they go to the system printer. The user can also create digital reports by exporting the printouts to a Adobe® pdf file instead of printing them. There is also an integrated link to easily customize and transfer feed records directly to QuickBooks® accounting to create invoices for your customers. The software is capable of storing up to 1000 different feed ingredients. Each ingredient has a 16 character ingredient code and a 32 character description for identification. Ingredients can be organized in different categories so that they are easier to find. The ingredient prices are recalculated and updated every time new inventory is received. These calculations are based on both the new and old ingredient prices and the inventory balances. The ingredient prices can be locked for certain customers with contract agreements. In addition a 5-Categories ingredient markup feature allows the user to easily select custom prices for different customers. The software can store up to 1000 different formulas, with each formula containing up to 32 ingredients . (more available upon request) Each formula has a 16 character formula code and a 32 character description for identification. Formulas can be organized in different categories so they are easier to find. There are 10 user selectable nutrients values for the formula that the can be displayed on the screen while balancing a ration. 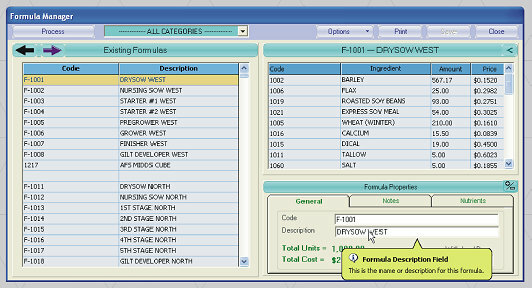 Individual formulas can be imported from major least-cost or other formulation systems. 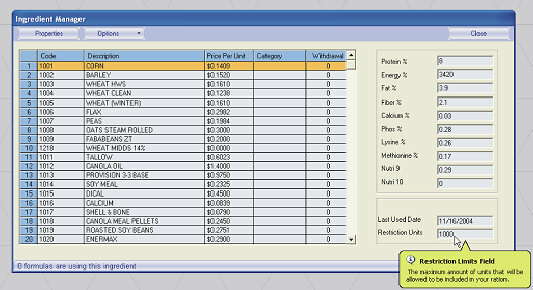 The user can also setup the software to display FDA withdrawal warnings and to restrict ingredient usage in a formula. There is also a module available for creating cue files for automated feed-mill batch controllers. The Maximix feed management software was designed for improving labor efficiency, accuracy and profits in both modern feed mill and livestock operations. The software seamlessly integrates ingredient price management, real-time inventory control, formulation management and feed cost and usage reports. 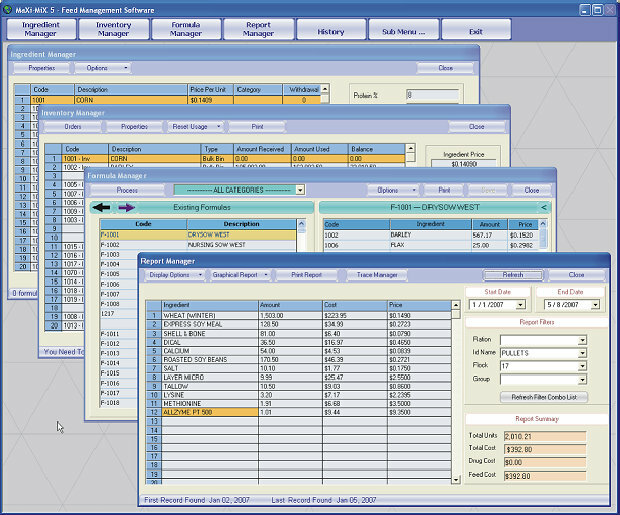 The software has numerous user selectable and predefined printout forms, including customized mixing sheets. The user has the option of previewing the printouts on the screen before they go to the printer. Digital reports can also be created by export the printouts to a Adobe® pdf file instead of printing them. Other features include importing formulas from least cost formulation programs, ordering products with purchase orders and transferring feed records to QuickBooks® accounting. It also includes full raw ingredient and finished feed traceability.